Successfully Added GPS Navigator - 6 Inch Touchscreen, Wireless Rear View Camera to your Shopping Cart. 6 Inch Touchscreen GPS Navigator with Wireless Rear View Camera: A top notch touchscreen GPS navigator that comes with a colorful menu display, multimedia functions, and a rear-view wireless camera. Enjoy the crisp 6 Inch large touchscreen as you navigate effortlessly with this quality GPS Navigator. The menu icons on this GPS hand held navigator come with a graphical refresh unlike tradition mainstream models, and it presents a more colorful interface with finer gradients. If you want a high quality GPS solution for your travel management, this is the product to look at getting. This wide screen GPS navigator supports spoken voice directions, automatic route re-calculation and even the choice of 2D or 3D mapping view that lets you find your way more easily. The Bluetooth function allows you to pair your mobile phone with the GPS and make phone calls hands free. Your driving is safer with this product, which means you and your family or other passengers can relax more and enjoy the journey. With this device you do not have to dismantle your vehicle’s dashboard and install a car DVD player if you don’t want to. This handheld GPS navigator with built in multimedia applications offers you a variety of entertainment options for using it in your car, including music, video, games and e-book. Additionally, this 6 inch touch screen GPS navigator's FM transmitter along with the Bluetooth feature allows drivers to pair their cell phones with the GPS navigator and enjoy hands free calling and listening to your favorite music through you cars stereo speakers. Your media interests are well looked after with this great gadget and you can enjoy driving to its fullest. This 6 inch GPS navigator comes with a wireless rear view camera that helps you reverse and parallel park with comfort and ease. The wireless rear view camera gives drivers the confidence in reverse and parallel parking. Further-more, installing this wireless rear view camera is easy and takes a mere few minutes. This ip66 wireless rear view camera is designed to be able to handle the harsh weather of the outdoors such as snow, hail, rain and fog. This is a product that is proven to last and will also prove to provide you with the functionality you require. 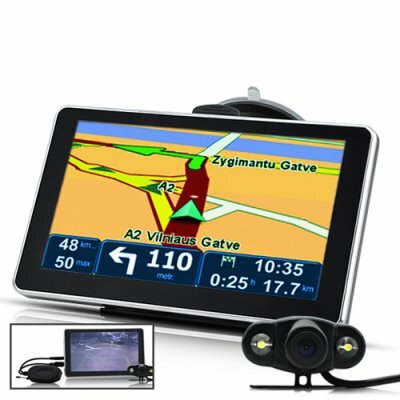 This 6 inch touchscreen GPS navigator and wireless rear view camera makes a great electronic car gadget for drop shipper’s and eBay resellers. It’s in stock for single or bulk order at a factory direct wholesale price directly from Chinavasion. This GPS is really good. Works very well with most GPS software. Wireless rear view camera works good as well. Highly recommended..
on 2012-05-25 05:36:53 Buena compra pero ¿ dónde actualizar versión firmware ? Buena calidad - precio , pero falta información sobre el fabricante , donde actualizar versión firmware , el manual no habla nada sobre la función de la cámara en relación a si al tener la cámara tensión , se ve automáticamente en pantalla ó hay que seleccionar algo , etc . on 2011-08-30 18:59:39 increcible for that price! It all works just fine! Great! You guys never let me down, it's proven once again! on 2011-08-23 00:41:26 ordered as required in full packed. most expected product in our company.fully ordered.